When it comes to DIY wedding centerpieces, we say: show off the fruits of your labor! Fruit displays bring a fresh touch to any fete and are typically very budget-friendly. In this simple DIY, pineapple pairs perfectly with a simple bunch of flowers to create a centerpiece that’s nothing short of wedding-worthy. 1. Cut the top off of your pineapple and discard it. 2. Use a sharp knife to cut your floral foam into a size and shape that will allow it to fit into the votive holder. 3. Place the votive holder on top of the pineapple and trace around it using the knife. 4. Using the line you traced as a guide, scoop out pineapple until you have a space deep enough to hold the entire votive holder. 5. Put the floral foam into the votive holder, and place the holder in the hollowed-out pineapple. This is also a good time to pour little water into the votive holder; it can be tricky to water your flowers once your arrangement is complete. 6. Trim the flowers’ stems to your desired length and stick them into the floral foam to create your arrangement. The finished arrangement is so charming! If you’re feeling extra crafty, play to your wedding’s color palette by spray painting your pineapples to match your big day decor. 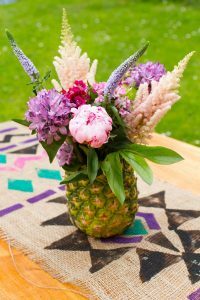 Set the finished vase next to a delicious bowl of pink pineapple punch at your vintage tropical wedding or bridal shower and promise it’ll be a hit!